I want to share how our family utilized a small place to set out food at our family reunion! We have a large family so we needed all the room we could get! The kitchen area only had a 3 foot wide cement counter so that's where all the food had to be placed. We used 2 children's small swimming pools that we purchased at Walmart, I think it was $4.88 each. 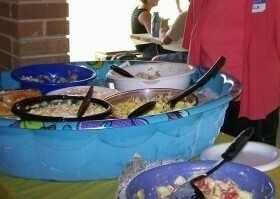 We just arranged the bowls and poured ice around it, We were under a pavilion and the food stayed cold all afternoon! Clean up is easy. Remove the bowls and dump the ice. Save the pools for future parties or reunions! Unless the kids claim them. Everyone said "Wow, who thought of this?" Sure helped put a lot of food in a small area. That is a great idea! I imagine if you didn't want the pool to show, you could just cover the pool with a round vinyl table cloth, then fill it with ice, the cloth would drape over the edges and hide the pool. That's true you could cover it, but decorative designs around the edges are attractive and summery looking and colors often match the bowls. Plus its a conversation starter. Family loved the idea too :) Thanks for the reply, try it. I have done this for a couple years but I use the one ring vinyl pools. they fold up smaller and are easier to store and pack. Works like a charm.